Technique / Materials: installation, wood, pill dispensers, rockwool, speakers and sound. 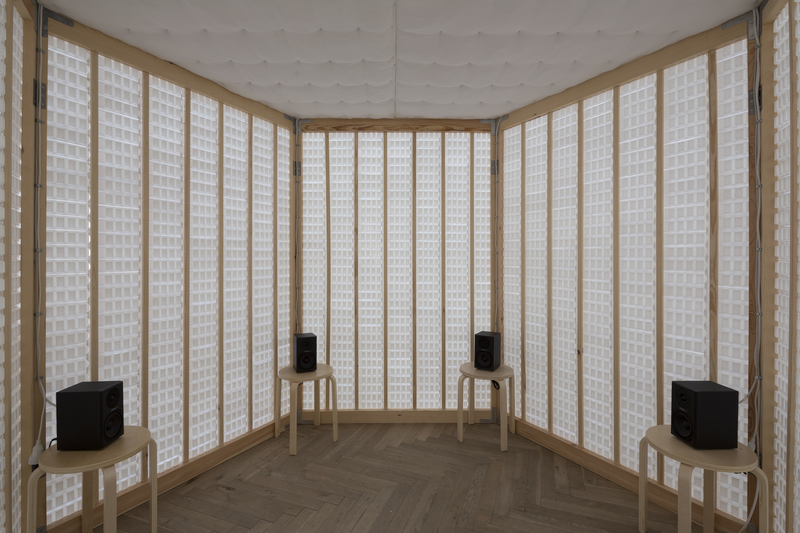 The audience is invited to join in the hexagonal installation made ​​of large wooden frames of identical length and filled with hundreds of small medical pillboxes. Partially inspired by the structure of the “logical hexagon” (named by the French mathematician and logician Augustin Sesmat and philosophy professor Robert Blanche), Ana Pavlovic asks the public and herself a universal question: Who decides who is normal? The artist questions the definitions and social prejudices that exist between the concepts of normality and the corporate world of pathology and medication. In a way the shape of Ana’s installation reminds us of ‘Panopticon’, the type of penal institution that the French philosopher Michael Foucault discusses in his book Discipline and Punish. 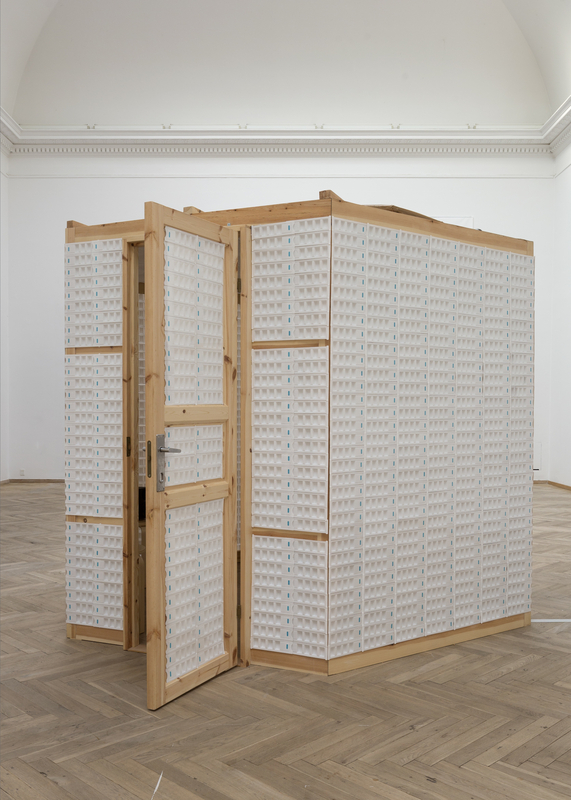 While Foucault talks about the social structures and models of supervision of prisoners and their adjustment to prison life rooted in self-monitoring and self-control, Ana’s visual installation turns our eyes to the social structures that exist in connection to psychological problems. Her installation is concerned with different model related to the power of surveillance of mental health. Only by entering the installation can the visitor experience the entire work. The observer is seated in the only available chair, a chair that is positioned in the middle of the structure. In each corner of the room an identical chair carries a loudspeaker. Each speaker represents a person. These unseen individuals interact with each other and the viewer quickly grasps the accumulated meaning of that dialogue. The six characters participate in a conversation reminiscent of group therapy. We hear people suffering from mental illness, as well as their relatives and counselor. But they are invisible; we are present. The natural human impulse would lead the observer to try to understand the different characters through empathy. However, it seems that Ana deliberately obstructs complete identification with the characters, as the voice of each is not a stable, continuous presence. Instead, they are modified, punctuated, and complicated by sudden outbursts, which cast doubt on the authenticity and the sympathy of the speaker. The flow of dialogue shifts between direct and often thoughtful discussions and more superficial, abrupt and even judgmental talk reminiscent of online discussions and comments among faceless and nameless participants. 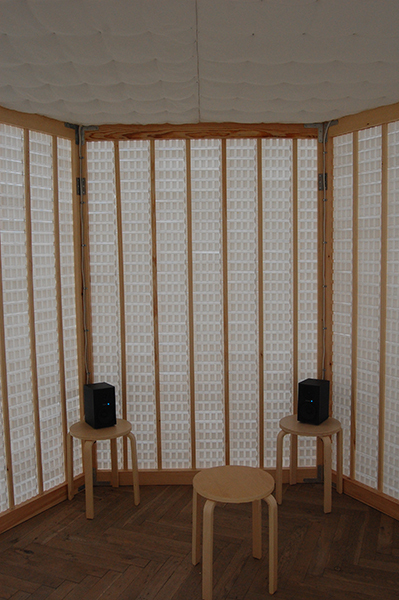 The loudspeakers provide the same type of anonymity and absence of self-censorship as online culture. The structure of the installation is covered with medical pillboxes. 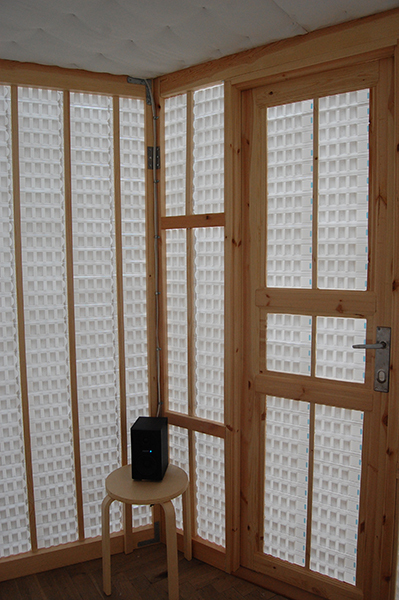 Their shape resembles the shape of soundproofing material that can be found in audio rooms. In this case, Ana may be showing us that the true “hidden guardian” in the mental health system is to be found in the corporate medical establishment which arguably dictates the norms and the culture surrounding mental illness.